I'll give props to my husband; he's an amazing cook. He will make up a concoction and it will come out tasting like a gourmet meal. I'm not quite as gifted. I'm the one that usually comes up with the meal plans, while he's the one that executes them. I get creative from time to time, but don't really venture with new or foreign ingredients. I recently discovered an amazing company that gives me all I need to create marvelous cuisine. All the ingredients and recipes are provided for the meal plans and all I have to do is follow the instructions. Home Chef has made it easy for me to fix meals that are tasty and out of the ordinary. 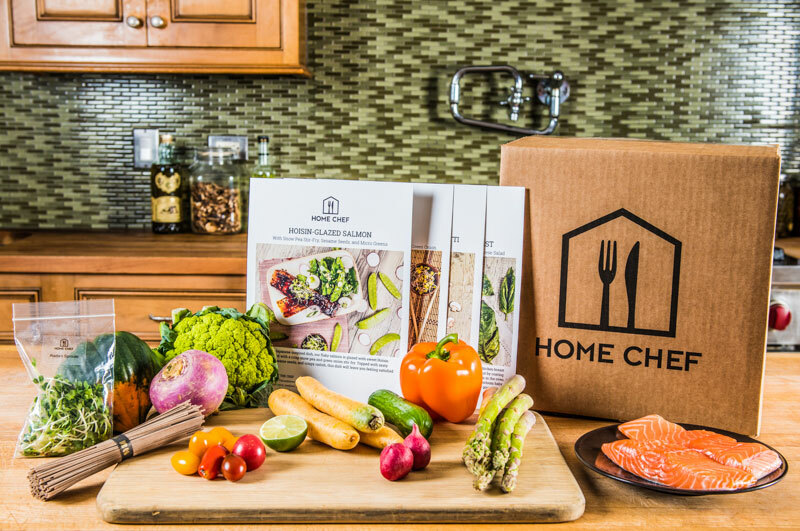 To join Home Chef, you simply create an account, select your dietary preferences, number of meals per week, and your delivery day. New recipes are available each week. Based upon dietary preferences, Home Chef selects which meals you will most likely be interested in. However, you can select and deselect to get the meals you truly want. I received a 2 person meal plan from Home Chef. I was able to go on the site and go through the steps to set up delivery. I first went through a generalized checklist, giving my food preferences. For instance, I could indicate that I didn't like or eat pork and it would not be sent to me. I was able to view all the week's recipes and ultimately select which meals I for sure wanted to receive. Home Chef sends weekly deliveries Tuesday through Friday. You can select the day of week that’s most convenient for you. When my delivery arrived, it was packaged very well. The food was insulated with insulated liners and gel packs, so it wasn't necessary for me to pickup the package as soon as it arrived at my doorstep. The food itself was tightly sealed and packaged. The recipe cards for each meal were easy to follow. Prep time for each meal was approximately 15 minutes, and cook time for each one took approximately 40 minutes. The only extra ingredients I needed to provide myself was olive oil, pepper, and salt. Although a lot of dishes were used for preparation, I almost felt like a master chef after preparing each meal. They were visually appealing and tasted delectable. My husband and mother were just as impressed. The spice blend for the salmon was a little hot but that's the only thing I wasn't a big fan of. Everything else had an amazing balance of flavors and some of the ingredients I wouldn't have thought of pairing together on my own turned out quite well. If I had to choose, I'd say my favorite was the Bleu Cheese-Crusted Sirloin Steak meal, but all three were quite fantastic. The good thing about Home Chef is that there's no minimum commitment. You can skip a delivery or cancel your subscription at any time before the weekly cutoff. I was quite satisfied with the company and its delivery of fresh ingredients and recipes. Have you ever used Home Chef's services? That's actually pretty cool. I've never heard of a meal ingredient home delivery service. What will they thing of next? It certainly looks delicious! Having everything delivered like that would be so nice, too! The salmon and the Bleu Cheese-Crusted Sirloin Steak both look so delicious, I am inspired to cook these now.